Are you one of those that suffer from Rosacea??? Please keep reading because you are not alone. It is time to break up with your makeup! Instead of concealing your redness, why not start treating it? I am fortunate enough to not have this condition but 16 million Americans actually suffer from it! And instead of enjoying the beauty of makeup, makeup products have became a reason for these women suffering Rosacea to conceal the redness of their skin instead of having fun with makeup! And when you are always on the hunt for the perfect cover-up for those redness, it can get costly! Aren't you tired of this? Wouldn't you want to treat it instead?!? Mirvaso (brimonidine) topical gel is the first and only prescriptive gel that was developed to treat the redness caused by Rosacea. You will see it working in less than 30minutes and it will keep the redness away for up to 12hours. Indication: Mirvaso® (brimonidine) topical gel, 0.33% is an alpha adrenergic agonist indicated for the topical treatment of persistent (nontransient) facial erythema of rosacea in adults 18 years of age or older. Adverse Events: In clinical trials, the most common adverse reactions (≥1%) included erythema, flushing, skin burning sensation and contact dermatitis. Warnings/Precautions: Mirvaso Gel should be used with caution in patients with depression, cerebral or coronary insufficiency, Raynaud's phenomenon, orthostatic hypotension, thromboangiitis obliterans, scleroderma, or Sjögren’s syndrome. Alpha-2 adrenergic agents can lower blood pressure. Mirvaso Gel should be used with caution in patients with severe or unstable or uncontrolled cardiovascular disease. Serious adverse reactions following accidental ingestion of Mirvaso Gel by children have been reported. Keep Mirvaso Gel out of reach of children. Not for oral, ophthalmic, or intravaginal use. 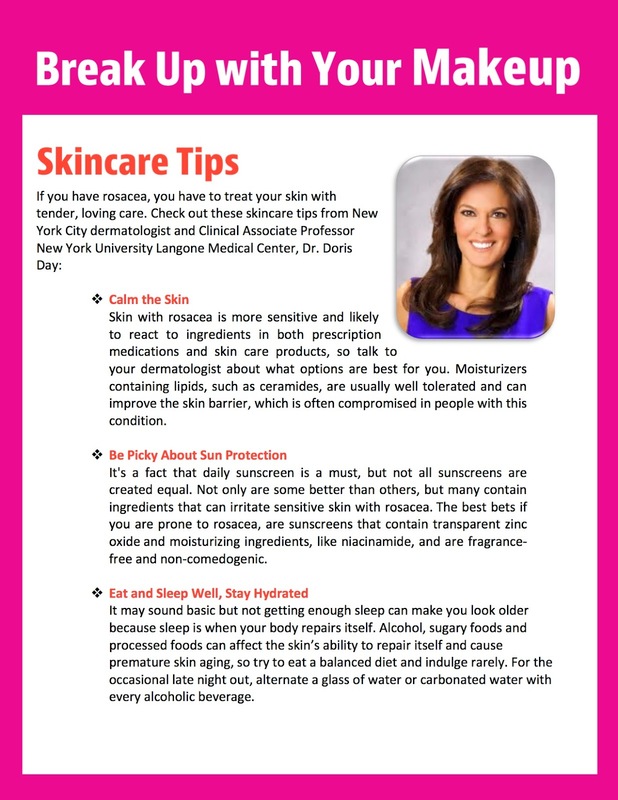 Even though I don't suffer from Rosacea, these skin care tips are applicable to us still... Always hydrate as our skin do show signs of dehydration and dryness when we are not drinking enough water. And those baggy eyes are there because of lack of a goodnight sleep! So a nice 8-hour sleep will truly make a difference. Make sunscreen as part of your AM Routine and NEVER forget or skip this step! Lack of sun protection will show early signs of wrinkles and sun damage on the skin. And you can also enter for a chance to win a trip to The Emmys at the very top of this post! Just enter your email address!!!! This giveaway is for U.S Residents only! Winner will be contacted as soon as all information has been checked and he/she will have 72 hours (3 days) to reply back with his/her mailing address. The Cetaphil gift pack will be sent by the company. 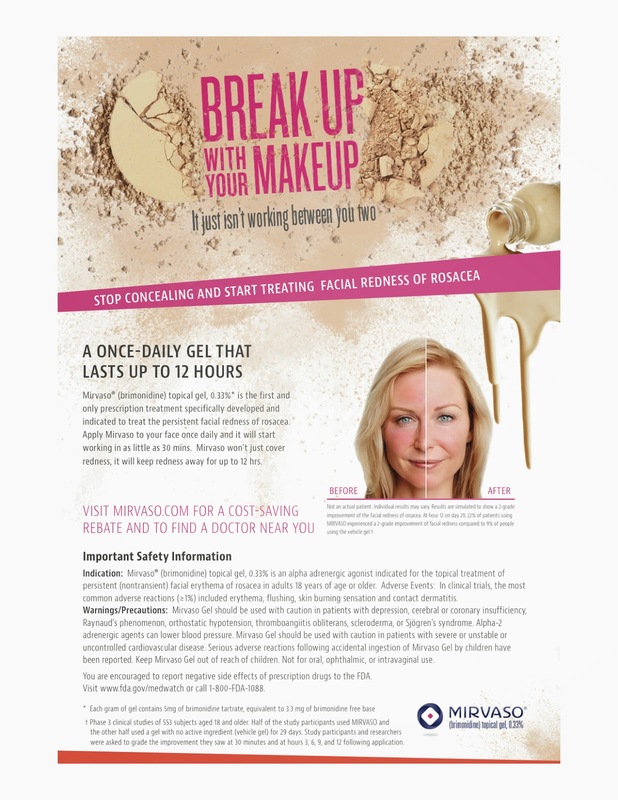 *disclosure: I’m participating in the Break Up with Your Makeup contest sponsored by Galderma Laboratories, L.P.